The Nisga’a Lisims Government hosted the “Nisga’a Amazing Race” for youth from grade 8 to post-secondary on August 22nd. The race consisted of language, culture, interaction with elders, learning about the four village governments, the hoobix exhibit at the Nisga’a Museum, and learning about the Nisga’a treaty. Starting in Gingolx, five teams of four competitors completed challenges in each village, including running up Grizzly Hill to the Nisga’a Museum! 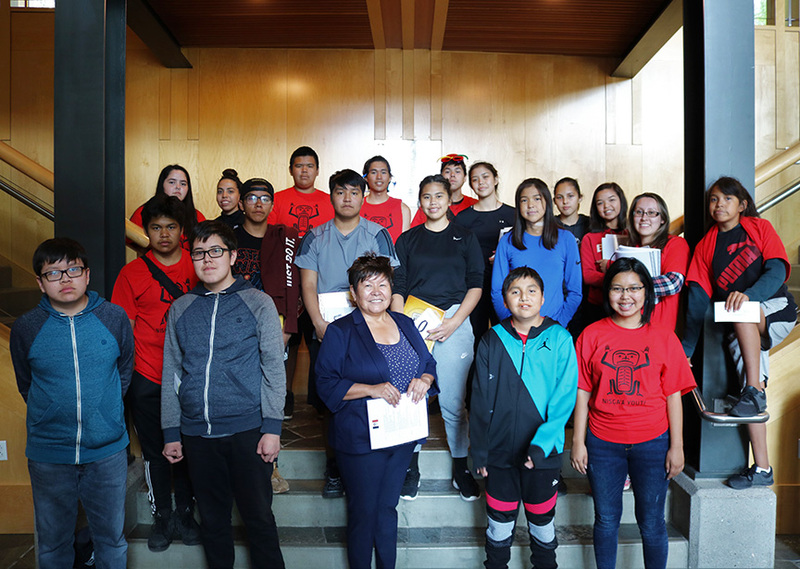 At the final stop at the NLG building, President Eva Clayton addressed the competitors in the chamber about including youth as representatives alongside elected officials when they travel, and about the importance of the Nisga'a treaty being taught into the education system. Congratulations to the team from Laxgalts’ap for winning first place! Prizes were generously donated by NEST and the Gingolx and Laxgalts’ap village governments. Thank you to NCFS for providing and manning the water bottle stations in Gitwinksihlkw and at the Museum after the teams ran up Grizzly Hill! And a big thanks to the Citizenship and Programs & Services departments for helping with logistics. We’re looking forward to hosting this event again next year!